We’d love your help. 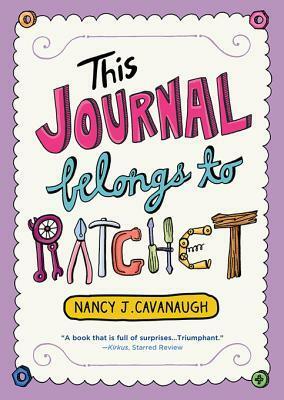 Let us know what’s wrong with this preview of This Journal Belongs to Ratchet by Nancy J. Cavanaugh. If only getting a new life were as easy as getting a new notebook. Project Goal: turn my old, recycled, freakish, friendless, motherless life into something shiny and new. This year, I'm going make something change. To ask other readers questions about This Journal Belongs to Ratchet, please sign up. Im still reading the book right now, and I have one question... Why doesn't Pretty Boy care about other people's opinions? It could really benefit society, especially Rachel's dad's lectures. Rachel just wants a normal life (and a normal nickname),but it's hard with a crazy dad and no mom. I love this book and you learn to love all of the characters and can't help but to cheer on Ratchet when she learns about love, appreciation, and friendship, which does sound a little cheesy but it's not it's an inspiring and hilarious book. Have you ever wanted to feel how a girl that lost her mother lives with a crazy dad with little money lives. Well I definitely won't be living that life because of the things that happen to Rachel (the main character in the story) like her crazy dad and it being hard for her to make friends, now that's a life I wouldn't want to live like that. The genre of this book is realistic fiction I know this because the events that happen in the story sounds like they'll actually happen to a girl in real Have you ever wanted to feel how a girl that lost her mother lives with a crazy dad with little money lives. Well I definitely won't be living that life because of the things that happen to Rachel (the main character in the story) like her crazy dad and it being hard for her to make friends, now that's a life I wouldn't want to live like that. The genre of this book is realistic fiction I know this because the events that happen in the story sounds like they'll actually happen to a girl in real life with all the things and problems that happened in the story, like trying to save their town park, crazy environmental father, dead mother, and living rundown houses. The story takes place in many different places but one of the most important places is Rachel's house because of course that's were most of the story takes place and that's were she lives, another place is Moss Tree park because that's the place Rachel and her father are trying to save. Rachel has lived a very hard and weird life with her dad and no mother because she died in a car accident at the beginning of the story, and through out the story she tries to find thing that can tell her more about her mother so she can be like her. Close to the end of the story***spoiler alert*** she finds out what is in 'The Mystery Box' and in it she discovers why her mom had left her and her dad because she was tired of living in run down houses and she was tired of Rachel's dad of working all the time. The most vital problem with her life is that she is constantly moving so it hard for her to make friends and the theme of the book is to be yourself I know this because Rachel wanted to be all fancy and stuff but she learn from her "friend" wink wink Hunter that she is ok just the way she is. Moss Tree park the setting adds to the conflict because later on in the story Rachel, her father, and her group of friends try to save the park, because the town mayor wants to bulldoze it down to bulid a srip mall. The first person point of view affects the story because we can see what Rachel is thinking and feeling all the time, but we know nothing the other characters are felling that's the down side of first person but it's still great because we can understand what the main character is going through. The title relates to the story because the girls nick name is Rachet which was given to her by her dad and once she finally gets a journal she decides to write a story in it instead of using t for educational purposes. I though the ending was a little bit disappointing because we never got to know what happened to hunter because we never got to see if hunter started to date Rachel due to it looking like they loved each other. If I were the author I would make the story a bit longer and make Rachel and Hunter date to make the story a lot more interesting, also I will make Rachel's dad start dating again this will make Rachel get very nervous about what her step-mother will treat her like or how she'll be like as looks are concerned. Ratchet is ready for a change. Although she earned her nickname from the countless hours she spends helping her father fix cars, Ratchet has a new goal -- to learn to be more like her mother. Since her mother died when she was a very young girl, Ratchet has had only her eclectic father as her guide, which has resulted in a wardrobe of mismatched clothes from the Salvation Army and a distinct lack of friends since she is home-schooled and can't quite figure out how to relate to other children her Ratchet is ready for a change. Although she earned her nickname from the countless hours she spends helping her father fix cars, Ratchet has a new goal -- to learn to be more like her mother. Since her mother died when she was a very young girl, Ratchet has had only her eclectic father as her guide, which has resulted in a wardrobe of mismatched clothes from the Salvation Army and a distinct lack of friends since she is home-schooled and can't quite figure out how to relate to other children her age. Ratchet's father has a reputation for being a bit unusual. He wears his hair long, moves his daughter from one run down house to another (where he offers to completely redo the homes in exchange for free rent), and divides his time between fixing cars and protesting all things anti-environmental. So, by the time she is 11, Ratchet is seen by her peers as the homeschooled weirdo with the semi-criminal hippie father, which is not exactly an impression that leads to long lasting friendships. During her new quest to uncover hidden secrets about her long lost mother, Ratchet discovers a mysterious box that may hold clues to her mother's past. At the same time, Ratchet manages to get herself involved in a go-cart workshop as well as a major protest in attempts of saving a local park from becoming another strip mall. Will Ratchet manage to transform herself from a quirky tomboy to a likeable young woman without compromising her spunky personality? Can she learn what her father is hiding about her mother's past? And does an 11 year old girl have a shot at saving the environment while saving herself along the way? THIS JOURNAL BELONGS TO RATCHET is a cute, fun, quick read told through a variety of different styles, unified as a language arts project by an 11 year old girl. Alternating between poetry and daily journals, Cavanaugh creates an entertaining picture of a highly relatable, smart and witty young girl who is struggling to find herself by learning more about her past. I loved the way that Ratchet always managed to find a fierce loyalty to her father, no matter how weird and outlandish he seemed to get. And the lessons she learns by the end of the book are heart-warming and adorable, definitely a charming new spin on a familiar middle grade theme. Probably the best book I've read all year. What if searching for a new you changed you completely? This is a story of a girl who searches for her new identity but realizes that she has changed completly but always was herself along. This book is realistic fiction becouse it can be completely real. I really liked this book for many reasons one its very real and very well written. This book is about a girl named Rachael but her dad calls her Ratchet . Ratchet is a girl who's mother passed away when she was little she now lives with her father What if searching for a new you changed you completely? This book is about a girl named Rachael but her dad calls her Ratchet . Ratchet is a girl who's mother passed away when she was little she now lives with her father . They often move a lot because Ratchet dad fixes houses and while doing that they stay there for free but they are not normal Ratchet and her dad always get rude comments because they are always fixing cars and they are always dirty. Ratchet is homeschooled and writes in her diary (English language arts notebook .) She is trying to be a new person change how she looks not be dirty anymore have friends and blend in. But living in Blainesfield can be complecated the town people think Ratchet and her dad are wierd. Ratchet's dad is an environment freek he thinks that a forest must not be cut down so in order to do that he steels the machine's keys. When that happens he has to pay a fine do community hours. Meanwhile Ratchet is trying to find things about her mom that way she can be like her. She believes there's a box that could help her meanwhile she starts taking classes that could help her be mature but she feels she dosent belong there and leaves. Later she finds out that her father has to teach boys how to build a go kart and teach them mechanic stuff becouse he has to pay for stealing the keys. She later joins in with her dad and she starts to get noticed she feels like she has friends but when and accident happens and Ratchet's dad is not there they take him out of the job and make him clean the streets. Ratchet is now more embarrassed than ever and realizes that the boys only noticed her when they needed her. Later a boy named Hunter starts asking for Ratchet's help she later becomes his friend and the boys start getting help from Ratchet she later finds the box of her mom's and realizes stuff that change her completely. Ratchet now feels guilty about many things she has done. She later has to do a persuasive essay and she does it about saving the forest. Later Hunter turns in her essay on a contest and the mayor deciedes to discard the plan about destroying the forest. Lastly Ratchet feels better about her life and her great dad. And of course the mission to save the forest is successfully completed. This books conflict is that Rachael tries to be normal but things just get more complicated but at the end things just get the way they should be and Rachael feels great about her new life. This books theme is to believe in yourself to succed and not think of peoples opinions becouse Ratchet believed in her self to find her identity. The main characters point of view affects the story becouse it's showing you her feelings her taughts. For example Ratchet explains that she wants to be a better person and she lists things she wants to accomplish. A major event that change the charecter was when Ratchet found out that her mom had left her and her dad. Ratchet feels that been like her mom wouldn't be good and realizes that all along she's been like her dad a very good person. The charecters motivation about saving the park is very great becouse she makes people think about what a big mistake it would make if they cut down the forest. The structure of the book adds to this story becouse it's showing you ELA things like comparisons between the story about people etc. The authors word choices are very helpful to the reader becaouse the storches y is basically from a normal girl who writes in her diary. So the authors word choices are completly easy to understand. The title relates to the book becouse its Ratchets notebook were she writes her tought and feelings. I was surprised when Ratchet decided to be more like her dad becouse all along she was like him and she had nothing in common with her mom. I liked the way the author made the story becouse it's basically showing you Ratchet's life in an ELA notebook. An interesting thing I learned in this book was that Ratchet never gave up even thought her life was complicated. I thought the ending of the book was great becouse Ratchet feels good about her self , about her great new friends and most important she is happy to have an amazing dad. I was satisfied with the story becouse its very realistic and well elaborated on every single part of the book. For example Ratchet believes in her self so much that she just inspires you to do something that amazing. The charecters actions are believable becouse Ratchet just tries for new change and she suceeds. I you believe in something so bad you will completely it just like Ratchet did. Recommends it for: Notebook lovers and people who like reading about great morals. A few weeks back, I went to a brand new library that my town put up so I can see it in its beauty. When I got there, I was not disappointed in the least. It's a lot larger than the other libraries near where I live. There are floors with so many bookshelves and so many books on those shelves that I just could not handle it; I was so excited! During my venture, I walked by a table highlighting a whole bunch of middle-grade novels. One of those books being This Journal Belongs to Ratchet. I have a A few weeks back, I went to a brand new library that my town put up so I can see it in its beauty. When I got there, I was not disappointed in the least. It's a lot larger than the other libraries near where I live. There are floors with so many bookshelves and so many books on those shelves that I just could not handle it; I was so excited! During my venture, I walked by a table highlighting a whole bunch of middle-grade novels. One of those books being This Journal Belongs to Ratchet. I have a bit of an obsession with notebooks so when I saw the design for this book, I snatched up this baby like it was the last donut at the coffee shop. (If you've seen this book in person, then you know it resembles that of a notebook. It has lined pages and font that resembles handwriting.) I couldn't get enough of it. However, just because I loved the design of the book, did not mean I was going to love its content... I took a risk with this read... and I am glad I did! The writing style for this book is phenomenal. In fact, I don't think I've ever read a book quite like this. It takes writing prompts one might use in school and adapts it to the life of Ratchet, the main character. For example, Ratchet might have to write a poem and in that poem she will base it on what's going on in her life at that particular moment. Or maybe write a fantasy story using the people in her life as the main characters. It's a very creative way tell the story to children that's never boring and always innovative. It makes me want to write down some of these prompts so I can practice my writing a bit more! The characters were all wonderful. Even the snotty kids were painfully enjoyable (if that makes any sense). Ratchet is a bright, loving, and cheerful girl that I loved reading about. I wanted to see her grow from who she was at the beginning to who she became towards the end, as this story is pretty much her coming-of-age story. She develops a friendship with a boy named Hunter that doesn't seem force at all. Her relationship with her father is among the best relationships I have read in a book in a long time. Her father is slightly odd but that's what makes him special to her. I don't want to say anything else about it because this book is about that. It's about the relationships Ratchet makes throughout the story and how she comes to terms with who she is and I feel that it is something the reader should discover for themselves. If only getting a new life were as easy as getting a new notebook. But it's not. Everything in my life is old and recycled. Dad's motto: "If the Good Lord wanted us to throw everything away, he would've put a Dumpster right outside the Garden of Eden. Ratchet is 11 and she has always been homeschooled. Her mother died years ago and her father has been raising her alone. Since she was six, she has been helping her father with his job - he fixes cars in the garage. Her real name is Rachel, but no one calls her that. Her dad gave her the nickname because she reminds him of a ratchet, the way she helps make all his jobs easier. Ratchet doesn't like being different. She doesn't like that her father doesn't have a job where he wears a suit and goes to an office. She doesn't like being homeschooled. And she doesn't like never having any friends. This year, Ratchet has decided her life is going to change. She is going to make a friend. This is a enjoyable story about a young girl trying to find her way. The story is told via entries in Ratchet's homeschool writing journal. Ratchet's voice is believable and quite relatable. She worries constantly that she is different and her father is different. She wonders about her mother. She wants to know more about her mother to maybe find out more about herself. And most of all she wants to find a friend. Since she doesn't go to school, making friends is harder than usual, but she is determined. I enjoyed reading Ratchet's story and I was rooting for her all the way. I wanted her to realize that people will like her for who she is and that she doesn't need to change for others. This was a great book. It was funny and relatable at the same time and truly touched me. I cried twice while reading it. The part that was so great about it was that Ratchet experiences something that many children have felt, but the way she describes it is so touching. The book shed a new light on the situation children with divorced/dead parent(s) are in. Ratchet is a very inspirational heroine and I very much recommend this book to everyone. This book was pretty good. It has one of those perfect endings in which everything works out very nicely in a slightly unbelievable way. I already know at least 3 of my students who are going to love it. They are always asking me for books that will make them cry, but end happy and I think this one will be perfect for them. It was a great book!!! I know it took me sometime to read but the holidays are here!!! I love that it all ended well I was worried about Ratchet mental state and Moss Park. I'm really happy Rachel aka Ratchet learned to appreciate her weird quirky dad and was able to make wonderful friends. This review has been hidden because it contains spoilers. To view it, click here. How would you feel if you grew up with no mom and a crazy environmentalist Dad who embarrasses you every were you go at would you do? Well in this book Rachel or better known as Ratchet has to face those circumstances in life and she wishes to have a much more normal life and father. The genre of this book is realistic fiction because the characters and names are made up BUT the events that happen in this book can happen in the real life. My overall opinion on this book was a good book were the How would you feel if you grew up with no mom and a crazy environmentalist Dad who embarrasses you every were you go at would you do? Well in this book Rachel or better known as Ratchet has to face those circumstances in life and she wishes to have a much more normal life and father. The genre of this book is realistic fiction because the characters and names are made up BUT the events that happen in this book can happen in the real life. My overall opinion on this book was a good book were the problem and solution scenario was easily found by the reader with some very suspenseful moments throughout the whole story. The setting of this book takes place in a small town named Blainesfield. The setting of the story is a factor to the story because it is an average town with Groceries stores,parks but wants to add more buildings to attract more people by destroying a park and replacing it with a Strip Mall. The main characters of the story is Rachel(Ratchet),Dad,Hunter,and the members of the City council. The members of the council want to replace the local park with a Strip Mall. However, this park was donated by a man named Mr. Moss who had donated all his parks around the world before he died. The dad wants to find the paperwork that clearly states that the parks he donated were for entertainment purposes. The dad does find the paperwork,but then suspiciously loses is it and there is nothing that can stop the city council from tearing apart the park into a strip mall. The dad spends the next month or so trying to find the papers again but failed. Additionally, while this is happening Rachel is trying to make new friends and helps a couple of boys who used to bully her, make a go-cart to race in the park that will be teared down. The type of conflict of this story is Person vs Society because Rachel has multiple people that she has to against, the council, his dad, Hunter, and sometimes even her self which could turn this into a Person vs Person situation for the story but only occurs in small parts distributed through the story. The theme of the story is always be yourself as Rachel learned when she wanted to be all pretty and fancy but then learned from Hunter, a boy that she had been helping build his go-cart, that she was fine the way she was. In the text it states that " I didn't need to be in "Get Charmed" class all I needed was a crazy dad and a great friend. The first person point of view affects the story because the reader only knows what Rachel knows and therefore may contain some opinions of people she likes or doesn't like. The author uses words like " I" and "me" do symbolize the first person point of view. A major event that changed the story was when Rachet found out that her mom did not die, she left the family. Rachel had been brainwashed by her father that her mother died in a car crash to not make Rachet think she was worth sticking around for. In the text it states that " Inside the Mystery Box was a folded note that was from Mom to dad explaining why she left the family. This crucially changed the scenario of the story because at first Rachet wanted to find out more about her mother so she can be more like her, but after this event it made her love her father more for all he has done for her and now she wants to be more like her dad. The title relates to the story because the title of the book is " this journal belongs to Rachet" because through out the story Rachet must express her feelings in special assignments assigned from her dad. The narrator is reliable because she has been educated to be honest from her father since a young age. My favorite part of the story was when Rachel and her father hot to save Moss Tree park beside that was but hit them with goals throughout the whole story. I was shocked when Rachet found out that her mom did not die, she left her and her dad, that was like a curveball to the reader NO ONE Expected it. I like the way the author used home schooled assignments to express the journey with the reader which is not an easy task to perform and requires a good author. If I were the author I would have made the mom return and turn out to be the person who stole the papers from the father which stated that the parks he donated around the word were meant to entertain and no be destroyed for other purposes in this case the strip mall. Best book about life. I seriously think this book is a great book. I think I would really recommend this book to anyone even adults. I love this book so much!!! This book helps me understand the different perspectives of kids who don't have a mom, and how they feel. I think this book is so funny, and enjoyable! I thank Mrs. Nancy J. Cavanaugh for writing this book! This book caught my eye in Barnes and Noble. Having never heard of the book, I picked it up and instantly knew I wanted to read it. So I bought it. I was so excited to get home and read this book, I pushed aside the other million books I have been reading and dove in. I was hooked from the first page and devoured the book. It is full of comedy, cuteness, and coming of age goodness. It was right in the middle of light read and realistic issues. I loved the characters, the relationships, and the journal entries. Ratchet is just starting her teenage years. She is home-schooled by her hippie mechanic father who she helps fix cars in between her studies. Her mother died when she was young, she has no friends, and she gets everything second hand. She wants a new life. She wants a new look, friends, and to know more about her mother. None of these things she sets out to accomplish are easy. She only has money to buy from Goodwill, all the kids in town think she and her dad are nuts, and her father keeps everything about her mother a secret. One of her assignments for school, is to keep a journal, in this journal she has a multiple of different writing assignments from free writing to poetry. In this journal she makes a plan... Get a new look, find a friend, and find the box of secrets of her mom. I absolutely adore this book. It was non stop fun. First off the book is written in very interesting journal entries. Free writing, plays, poetry, interviews, memos.. and so on. Every entry tells the story of Ratchet. I found the tone to be fun but filled with the undertone of a lost girl who has a lot to discover about herself. There were moments I got teary eyed, but for the most part it was full of laughs for me. I really loved Ratchets story. I couldn't help but feel for her. She was very lonely. Her father is always in the garage working on cars, barely even looks over her assignments, and he doesn't understand Ratchet at all. She really wishes she had a mom, but since she doesn't she just wants to know about her. Ratchet was also missing friends. Her story was a bit of a sad one, but there were also many great things in her life that she missed out because she couldn't see past the bad stuff. It was a great journey watching Ratchet grow. I think Ratchet is the best part of this story. I had no problem connecting to her at all. From the beginning I loved her. She was written well and her character was full of emotions, easily seen through her journal entries. She was smart and sneaky, misunderstood, and loyal. She was a wonderful character. There was a handful of wonderful characters in the book and a handful of not so great characters, villains in a sense. There was a clear line between those that were full of goodness and those out for no good. I loved that the great characters won out in the end. The story really is heartwarming, a very quick read, and just so much fun. If you like cute, heart tugging, coming of age books.. you will eat this one up. A homeschooled girl with her dad reusing everything possible like clothes, old cars, and their own house is anything but normal. This Journal Belongs to Rachet by Nancy J. Cavanaugh is an amazing book. It follows the life of the main character named Rachel, but her dad calls her Rachet because she is good with tools and a great help with her dad. The book takes place at mostly Rachel’s house. The main character, Rachel, writes in her journal about everything like her problems and her worries. A homeschooled girl with her dad reusing everything possible like clothes, old cars, and their own house is anything but normal. This Journal Belongs to Rachet by Nancy J. Cavanaugh is an amazing book. It follows the life of the main character named Rachel, but her dad calls her Rachet because she is good with tools and a great help with her dad. The book takes place at mostly Rachel’s house. The main character, Rachel, writes in her journal about everything like her problems and her worries. Her father, recycles and reuses literally almost everything. This story goes though the life of Rachel and her troubles trying to make friends and fit in. The book isn't so emotional but a little dramatic. I like learning about how another's person's life can be, overcoming their troubles. I think the kind of reader who would like this would love learning about different lives even if they are fiction. This book was entertaining and realistic with how Rachel triumphed over her problems. This book is absolutely charming. I fell completely in book-love with Ratchet immediately, and she's definitely one of those characters that you won't forget. I also felt so awful for Ratchet. The fact that her mom died is obviously so painful for her and her dad refuses to talk about it (or the mom at all) and Ratchet basically desperately wants two things: any sort of information about her mom so that she can be more like her and a friend. And that broke my heart, because those are two very, ve This book is absolutely charming. I fell completely in book-love with Ratchet immediately, and she's definitely one of those characters that you won't forget. And that broke my heart, because those are two very, very small wishes, you know? Because most people have friends and have the (to Ratchet, at least) luxury of knowing their moms or at least knowing ABOUT them. Ratchet is such a cute little girl with such a mature mind. I love how she's full support on her dad(even thought he can be embarrassing to Ratchet "most" of the time) and loves him the way he is. Ratchet did all she could to make sure Moss Tree Park was saved with her essay she did simply to pass the grade. It was a good idea and it ended up working. Also I'm very happy she finally had a true friend. Someone she can talk to and someone else who isn't her dad. What I disliked about this book was Ratchet is such a cute little girl with such a mature mind. I love how she's full support on her dad(even thought he can be embarrassing to Ratchet "most" of the time) and loves him the way he is. What I disliked about this book was it seemed it lacked detail. It also continued with a one tone theme. There was no surprises (only the one with why her mom left) but that was it. I really loved this book. I loved how Ratchet is a down to earth girl who shops at Goodwill, can make a go-cart run better than any boy and cares about her father. The journal is written in her handwriting in a wide variety of writing forms (poetry, how to, persuasive essay, etc.). Her entries are clever, entertaining and amusing, thinly masking her obvious feelings of loss and loneliness. Another aspect of this book that I like is the fact that Ratchet is a middle schooler, but the book is very accessible to ages 9 and up. It is not a difficult read and I think girls and boys alike will enjoy her story. Themes/topics include: loss of a parent, homeshooling, talents, global issues such as pollution and recycling, friendship, and self-acceptance. "If only getting a new life were as easy as getting a new notebook. This book was delicious. Uniquely told by way of writing prompts. The story of Ratchet is engaging, funny, heartfelt, and emotional. Ratchet is the girl we'd all do well to be friends with. I savored the book slowly reading more than 3/4 of it over a week, and then spent an emotional Saturday afternoon engrossed in the last section. I'm certain there are middle readers who need this book to help them consider looking "If only getting a new life were as easy as getting a new notebook. I'm certain there are middle readers who need this book to help them consider looking at their mother or father with fresh eyes. I'm even more certain that there are adult readers who need to consider looking at someone or something with new eyes. Well time spent reading this book. Recommended for Grades 5-8. This Journal Belongs to Ratchet is about 11-year-old Rachel, a young girl who is homeschooled by her Dad. Rachel documents her life in this often humorous journal, told in alternating poetry, essay, and diary entries. Rachel, otherwise known as Ratchet for her aptitude for fixing cars, navigates the tricky waters of adolescence without a Mom but with a Dad who loves her very much. From saving Moss Tree Park with a poignant essay, to teaching local boys how to build a Recommended for Grades 5-8. This Journal Belongs to Ratchet is about 11-year-old Rachel, a young girl who is homeschooled by her Dad. Rachel documents her life in this often humorous journal, told in alternating poetry, essay, and diary entries. Rachel, otherwise known as Ratchet for her aptitude for fixing cars, navigates the tricky waters of adolescence without a Mom but with a Dad who loves her very much. From saving Moss Tree Park with a poignant essay, to teaching local boys how to build a go-cart, Ratchet finds her place in the world. This. This is what a book about growing up mom-less should look like. The journal style writing makes this book easy to read for anyone. It’s so easy to pick up and put down, start stop, without feeling disjointed. Ratchet is a girl growing up with just her dad and just can’t find herself. Her dad doesn’t know how to dad well but is super passionate about saving the planet and the local park. Together they muddle through homeschooling and fixing cars in order to make ends meet. The friendships a This. This is what a book about growing up mom-less should look like. The journal style writing makes this book easy to read for anyone. It’s so easy to pick up and put down, start stop, without feeling disjointed. Ratchet is a young girl who lives with her dad and is home schooled. Her main concern is fitting in and being accepted. She wants to go to school and be like other girls, however her dad keeps her at home and she helps him work on cars (hence the nickname "Ratchet). Topics covered in the book include environmentalism and homeschooling. This is a coming of age novel with gender stereotypes questioned. The novel is written as if it is Ratchet's Language Arts journal with different chapters in diffe Ratchet is a young girl who lives with her dad and is home schooled. Her main concern is fitting in and being accepted. She wants to go to school and be like other girls, however her dad keeps her at home and she helps him work on cars (hence the nickname "Ratchet). The novel is written as if it is Ratchet's Language Arts journal with different chapters in different writing styles. Very creative. Overall a good story with a pleasant ending. Nancy J. Cavanaugh spends her winters in Florida enjoying the Gulf Coast and her summers eating pizza in her former hometown of Chicago. She loves reading middle grade novels. Her secret? She hasn't read an adult book in years. Like her main character, Abigail, Nancy J. Cavanaugh spends her winters in Florida enjoying the Gulf Coast and her summers eating pizza in her former hometown of Chicago. She loves reading middle grade novels. Her secret? She hasn't read an adult book in years. Who's happy to see you.